Today, nearly 800 million people suffer from chronic hunger, and by 2050, the world’s population is projected to increase to more than 9 billion. Ensuring that everyone has enough nutritious food to eat will require at least a 60 percent increase in agricultural production without adversely affecting the environment. Doubling the amount of food produced from the same acreage is a challenging goal, but for the last four decades, PlantCatalyst® has played an important role in reducing fertilizer usage and expanding production per hectare or acre. In most developing nations, increasing agricultural productivity for small shareholder farmers is the only viable way to combat continued poverty. 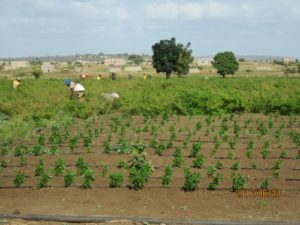 The primary solution many developing nations have used, in an attempt to increase shareholder farmer incomes, has involved either subsidizing the application of nitrogen-based fertilizers, allocating more land for farming, or both. not able to produce as much as in previous years without increasing the amount of fertilizer they use. has been used by farmers all over the world for more than 40 years to reduce dependence on fertilizer and water by up to 50% and to increase crop yield between 10% – 50%. PlantCatalyst® can be used for any crop or soil, and with any fertilizer or nutrient blend. It is easily adaptable to nearly any agricultural operation and can save farmers money by reducing and/or eliminating the need for high cost fertilizers. fertilizer needed to grow crops — thus, reducing greenhouse gas emissions. Invented in the mid-1960’s by award-winning chemist Dr. John Willard (PhD Purdue University), PlantCatalyst® (www.plantcatalyst.com) is a water additive catalyst designed specifically for use on plants and increases nutrient absorption among many other benefits. This complex proprietary formulation alters the molecular structure of water, creating molecule chains or “micelles”, and thus converting ordinary water into a very efficient catalyst which stimulates a variety of organic processes. One of the most pronounced effects is an increased efficiency of nutrient transportation to the cells. This helps the plant better absorb and utilize nutrients found in soil, microbes, micronutrients, fertilizers and other sources. It also helps the plants better maximize water intake making them a bit more resistant to the effects of drought and other stressful growing conditions. as 50 percent in a natural and climate-friendly way. Other benefits of PlantCatalyst® include: larger and/or greener plants; more blooms and/or plants blooming earlier; sturdier stocks and/or more extensive root systems; greater resilience in stressful growing environments; and more yield per plant, larger fruit/flowers and enhanced flavor and aroma. As greenhouse gas emissions rise, global temperatures increase, weather patterns change, our global water sources rise and become more acidic, farmers and their crops continue to be impacted. PlantCatalyst® is committed to helping farmers address these challenges through continued climate-smart development. Comprised of natural ingredients, PlantCatalyst® is completely non-toxic, which means that water runoff is 100% safe. Since PlantCatalyst® also helps plants better absorb and utilize nutrients found in soil, microbes, micronutrients—less nitrogen-based fertilizers are needed, which reduces the overall acidity in both soil and water sources.